This time we will focus entirely on brewing techniques. No milk. 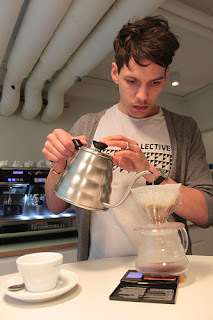 Torfi Torfason (who recently won the danish Brewers Cup) will guide us through the some simple but often forgotten methods to do really good coffee. There will also be a small competition for the brave ones. ...and a lot of chances to mingle with your barista collegues that we hope will come from all over town- everyone is welcome ! Sounds like my kind of competition, to judge anyways. Sounds fun!